In this life we are born into, we can choose to stand out or blend into the crowd. We can pass through anonymously or leave our mark on the world. We all have to play the cards we are dealt and make choices about what defines who we are as a person. This profile is about a woman who by all rights could have just faded into obscurity. She was born into this world a healthy, normal baby. At the age of eighteen months, a high fever took away her eyesight and hearing. Living in a world of silent darkness, most people would barely exist, stumbling through their lives oblivious to the world around them. Instead, Helen Keller was surrounded by people who cared. She developed hand signals to communicate with the people in her life. Her mother believed she could be reached and contacted Alexander Graham Bell, a man who worked with the deaf. Through various institutes and connections, a wonderful teacher entered her life–Anne Sullivan. A teacher filled with faith and patience who didn’t believe failure was an option, Sullivan began by giving Keller a doll. Then Sullivan signed the word “doll” over and over and over to try to form the correlation between the two in Keller’s mind. Keller became so frustrated that she broke her cherished doll. Sullivan’s patience overcame Keller’s frustration, endless repetition until that magical day arrived. Sullivan had been spelling the word “water” over and over in Helen’s hand. At the same time, Sullivan was running water over Keller’s other hand, and suddenly, the light bulb came on. Keller finally understood that the sign language in one hand and the things she was feeling with the other were connected. She pounded the ground and demanded the word associated with it. That was the breakthrough day; she learned the signs and meanings for thirty words that day. Her teacher was by her side for many years, and Helen was holding Sullivan’s hand on the day she died. From that momentous day forward, she had a thirst for knowledge, and the world opened up before her. She began taking speech classes, and although it took her twenty-five years, she was able to master the English language. She was a true pioneer, the first deaf and blind person to get a Bachelor’s degree. At the age of 24, Keller graduated from Radcliffe College with a Bachelor’s degree. Her education was paid for by an oil baron and his wife who were impressed with her drive and determination. She met some of the most powerful and influential people of her time, including Mark Twain who was very impressed with her zest for going beyond her limitations. Keller was a powerful advocate for the disabled community and handicapped individuals. She helped form The American Civil Liberties Union (A.C.L.U.) and founded the Helen Keller International Foundation, an organization devoted to furthering the cause of vision health and nutrition. She didn’t stop there; she traveled the world to raise awareness and funds for her causes. She was the first blind and deaf person to write a book, yet she went on to write twelve books, including her life story and her journey of faith that allowed her to walk with presidents and world leaders. She appeared in film, and she lived to see the blind and deaf community inspired by her ground-breaking life example. Helen Keller is a shining example for us all. She demonstrated that any goal is achievable if we believe in ourselves and find the spark. We are only limited by our beliefs. We can make excuses, or we can use our disabilities as a vehicle to make a difference, to inspire. Life is about the people’s lives we touch and how we want to be remembered. 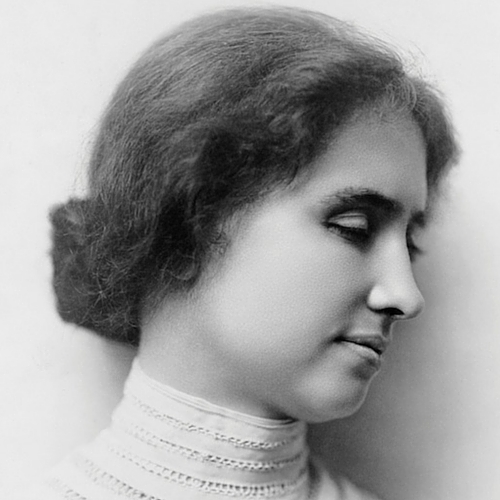 Helen Keller was a Southpaw who changed the world and left her mark on humanity. She was an amazing woman who expanded the boundaries of her comfort zone.